A well-appointed family villa set in an outstanding position on the coast, west of the village of Praia da Luz. The villa offers complete privacy within its own mature gardens but has wonderful views to the sea and towards Portimao. It is possible to walk along the cliff top to the village of Praia da Luz and would take approximatly 20 minutes. On the upper level (a few steps only) is the dining room and well-equipped kitchen with separate laundry room with washing machine and dishwasher. Off the kitchen is the Snug with twin beds and a sitting room with its own shower room. This is a large room so it is quite possible to hire an extra bed if the party is large. On the lower level is a large living room with plenty of comfortable seating, satellite TV and wood burning stove. French windows lead to the covered terrace which has table and chairs for dining outdoors. Steps lead down from the terrace past the built-in barbecue to the kidney shaped pool. A few steps down lead you to the other bedrooms. The master suite is at the end and has twin beds with dressing room and en-suite bathroom. The other three bedrooms also have twin beds. One bedroom has its own bathroom while the other two share a further full bathroom. All of these bedrooms have French windows opening onto the lawned gardens. Stairs to: Split-level living / dining room. Kitchen with access to suite (twin beds, bathroom with shower). 1 bedroom with two single beds, shower room with en-suite bathroom. 1 double bedroom with en-suite bathroom. 2 bedrooms with two single beds. 1 bathroom. We recently returned from our special family holiday at your villa, Casa Carola in Pria de Luz. I wanted to write to say how fantastic our holiday was. The villa was perfect. We all got so much pleasure from our stay there. How wonderful it was for us all to wake up every morning and open the shutters to the beautiful view of the garden and sea. Even the grandchildren commented on it. The villa had so much space which allowed for everyone to find a peaceful place to be if they wanted to. It was a pure joy to watch our children and grandchildren enjoying having the pool to themselves and being able to make loads of noise, even though the water was a bit cold! The only moan we had all week was when one of our grandchildren, an avid Liverpool supported, discovered the tv wasn't tuned in to watch the European Cup final and our iPads could only pick up a written commentary. Thank you for helping us to decide on the right villa for us. Our thanks also go to Emma in Pria de Luz who very quickly sorted out our problems with the WiFi and was there to answer any questions we had, and Ella, who sorted out the oven for us and our day at the water park. We were also grateful for all that Maria and her husband did to help with the cleaning of the villa. I do hope that we are in a position to use one of your villas again and I know we would all be very happy to return to Casa Carola. Praia da Luz is approximately 6km southwest of Lagos, the former capital of the Algarve. Praia da Nossa Senhora da Luz is the village named after the beach (the church/ parish) of Our Lady of Light. Adored for its sheltered bay and wide sandy crescent beach, Praia da Luz is located within a short drive of the protected Costa Vicentina Natural Park and some of the finest and most varied beaches in Europe. Praia da Luz, like neighbouring Burgau, was a small Portuguese fishing village comprised of little white fisherman's cottages along the cobbled main road (Rue Direita) leading to the village church and the side streets leading down to the beach. The recent pedestrianisation of the promenade along the beach and the introduction of a one way system have helped maintain the quiet traditional feel. The "praia" (beach) is wide and sandy, curving around the bay and at its rear has a raised pedestrian promenade complete with benches and Palm trees. Two water sports centres offer water sports, sailing and windsurfing at the eastern end of the beach. Praia da Luz also has a diving centre. The beach is sheltered with gentle waves, ideal for a refreshing swim in the clean sandy bay. There are life guards and a coloured flag system indicating the swimming conditions. With little traffic Luz beach is in safe walking distance of much of the villa and apartments accommodation in Praia da Luz. 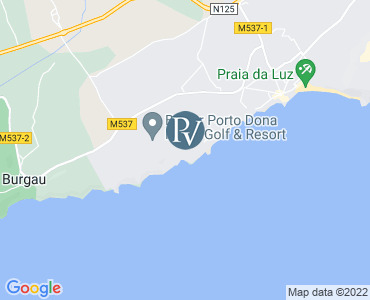 There are plenty of restaurants centrally located in Praia da Luz that offer up international dishes including Italian, Indian and a number of Portuguese restaurants. The Fortaleza restaurant offers good meals in a superb setting and cheap bites can be had in the cafes around the village. There are several small supermarkets including the Baptistas supermarket in town. However if you can make the Saturday morning market in Lagos you can stock up on a wide range of local fruit and vegetables including organic food and fresh eggs. Also be sure to visit the fresh fish market for the days catch. Barbecued fish, salads with boiled potatoes are a favourite. The Baptistas supermarket in Luz is not far from the village church and sells a good range of food including some local organic foods and imports for the holiday maker.